This is the first installment of Interesting Links Roundup. To start off, we have Hiding an Airplane Factory. An amazing feet of ingenuity, hiding such a massive building. Then we have Images of extreme Rich/Poor lines. Incredible contrast between the buildings on one side of a city and the other. From OhGizmo! 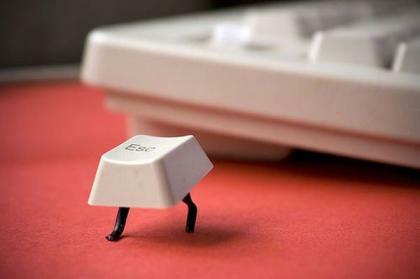 comes a silly picture of an ESC key, escaping. I found a story on digg about a CPU a professor created that's 100 times faster than the current best. It's actually 64 processors on one chip. And finally, from OhGizmo again, there's a story about super image resizing. Trust me, it only sounds boring. It's hard to explain what it does and why it is special here, but the video there will make it all clear to you. And that's it folks! Tune in next time.